The fact that this film was nominated in six categories for an Oscar and won only one in the sound editing category probably sums up what this film's main problem is - it somehow fails to deliver what it truly promises. In saying that I am in no way minimising the horrors of war or the sacrifice of too many (on all sides) who have fought in and been impacted by them. 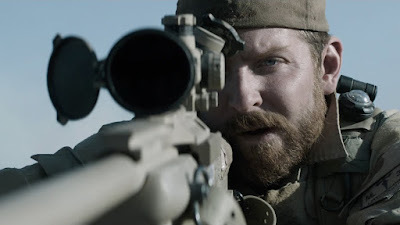 Bradley Cooper is in the lead role of Chris Kyle and delivers a performance worthy of his Oscar nomination. There is an even stronger performance from Sienna Miller as his long suffering wife, Taya. The story is biographical - painfully so. There are no real winners in war. The story really begins with a young Kyle growing up with his younger brother in Texas. The film briefly and crudely shows his father instilling in him the virtue of protecting your own at all costs. It also shows the young Kyle is quite a marksman with a hunting rifle. These scenes reminded me strongly of the family dynamics in Tree of Life. Kyle grows up riding broncos on the Texas rodeo circuit - and doing well from it. He exalts that he is living the American dream. The film is Directed by Clint Eastwood who leans towards a jingoistic, patriotic view of American identity. Not something that looks altogether appealing, particularly in light of the current Presidential nomination contests! All is well until 9/11 and Kyle's immediate response is to enlist at the age of 29 so that he can protect his own. He joins the SEALS to train as a sniper. He survives the brutal boot camp training and along the way hitches up with the intriguing, beautiful and inscrutable Taya. On his wedding day he gets the order to deploy to Iraq. Many commentators who served in Iraq commend the film for its realistic portrayal of the horror of door-to-door close combat warfare where everyone has to be viewed as a potential enemy and where even children wield RPG launchers. The film paints a picture of a theatre of war where the individual soldier is left to make the moral judgement of when to pull the trigger. The only time there appears to be any institutional morality is when there are US casualties and an investigation is needed to discover how they happened. The film throws up lots of moral and ethical issues and depicts a form of warfare that is messy, spontaneous and unequal. It creates a universal 'us versus them' scenario where grey doesn't exist and everything is rendered in high-contrast black and white. It also comes full circle in that Kyle's mission becomes the elimination of an Al Qaeda sniper who is becoming too successful in eliminating American servicemen. It is like a parallel rodeo or hunting confrontation. Who will win? What the film does portray extensively and with great sensitivity is the effect that operating in such theatres of war can have on the combatants. Becoming America's deadliest sniper not only attracted a $180,000 bounty placed on his head by Al Qaeda, but through PTSD turned Kyle into a distracted, insular and absent human being. This is where Sienna Miller's performance is so good. Her patient loyalty to the husband she loves sustains her when he returns home and his behaviour is barely recognisable. Everyday sounds transport him in an instant back to the theatre of war when pneumatic wrenches are heard as weapons of torture and a lawn mower becomes the sound of an attack helicopter. War changes people. I won't say any more about the story - I don't think I've spoiled things too much in what I've said above. What the film does show is the terrible cost in collateral damage that modern warfare seems to rack up without really trying. It also shows a self-justifying set of rules of engagement where perceiving a threat is taken to be sufficient justification for killing anyone. A sniper fights a clinically detached war 1000 yards from his victim. It also shows an 'enemy' who does not operate by traditional 'Western values' of warfare and is happy to coerce children and women into war through torture and threat. Two blind ideologies going head-to-head cannot have a good outcome. Whilst this film has many parts that are excellent and worthy of engagement, as a piece of drama it also has many flaws. For me this makes it simply 'another war film' as Hollywood tries to justify an unjustifiable war. Great performances from the two leads but in the end not a film I need to see again. I'll give it 6/10.